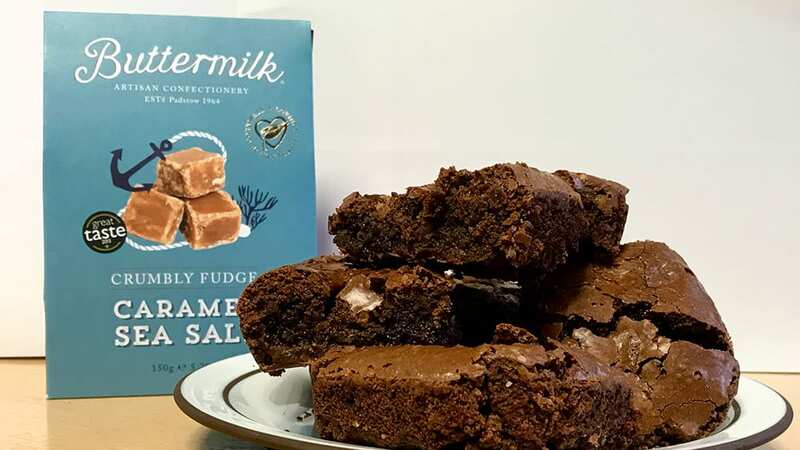 Buttermilk is a family-run business – Cornwall born and bred – with more than 50 years’ experience as craft confectioners. This award-winning band of fudgeteers have refined more than sixty exquisite flavours using locally and ethically sourced ingredients, all lovingly blended and stirred over open flames in traditional copper pots to stay true to their heritage, creating an irresistible taste par excellence. Weigh the unsalted butter and tip into a medium bowl. Break 200g dark chocolate into small pieces and tip into the butter bowl. Place the bowl into the microwave for roughly 2 minutes or until the ingredients have melted, checking every 30 seconds. Leave to cool. Turn your oven onto Fan 160C/ conventional 180C/ Gas 4. Grease and line your brownie tin. Break your eggs into the large bowl, add the golden caster sugar and whisk with your spatula until thick and creamy. Pour the cooled butter and chocolate mixture onto the egg and sugar mixture and fold in using a figure of 8 motion with your rubber spatula until the two have combined. Sieve the flour and cocoa powder into the brownie mixture. Repeat the figure of 8 motion until your mixture becomes thick and fudgy. Take your Caramel Sea Salt Fudge and cut your cubes to your preferred size. Fold half of the chunks into your brownie mixture. Pour the mixture into the brownie tin, then sprinkle the remainder of the fudge on top. For fudgy brownies bake for 25 minutes, your brownie will have a glossy top layer. If you prefer a firm brownie, leave the brownies for a further 5 minutes. Take your brownies out of the oven and allow to cool in the brownie pan. Once they have cooled, take out of the pan and cut into your desired size. Top Tip! – When you’re ready to slice your brownies, run your sharp knife under a hot tap as a hot knife will help to cut through the brownie with ease. Discover the divine taste of Buttermilk fudge when you visit Cornwall with Toad Hall Cottages. As one of the leading purveyors of holiday properties in the West Country, we’re the essential ingredient for your memorable South Coast escape.